There were a number of strong contenders for the 2014 award and deciding on with the shortlist provoked plenty of lively debate amongst us judges. The winner will be announced in Crimefest in May. 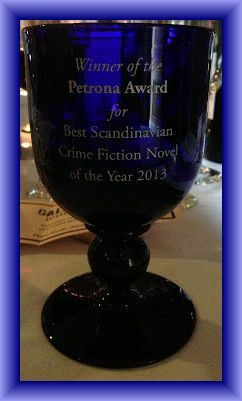 More details of the award can be found at the Petrona Award website. STRANGE SHORES: Drawn back to his childhood home by the unresolved disappearance of his brother, Inspector Erlendur takes on the most personal and difficult case of his career. Exploring the series’ enduring themes of loss and the impact of Iceland’s twentieth-century social transformation, this remarkable valedictory novel is one of the finest by a truly incisive writer, the undisputed king of Icelandic crime fiction. LINDA, AS IN THE LINDA MURDER: Leif G W Persson’s sprawling, state-of-the-nation novels make deft use of crime fiction conventions to expose the faultlines of Swedish society. This more closely focused novel is a brilliant exploration of a young woman’s murder, press sensationalism, and the inner workings of a police investigation, with readers introduced to the blackly humorous and truly unforgettable police detective Evert Bäckström for the first time. LIGHT IN A DARK HOUSE: Still mourning the loss of his wife, Finnish detective Kimmo Joentaa is called to investigate the strange murder of a comatose woman in hospital. German author Jan Costin Wagner delivers another wonderfully written and tightly constructed instalment in the Joentaa series, notable for its moving portrayal of a grief-stricken policeman and its in-depth exploration of victim and perpetrator psychology. Sarah, thanks for sharing the shortlist. I plan to read some Scandinavian crime fiction this year. Arnaldur Indriðason is on my list. As usual, I haven’t read any of these. The only author I have read is Nesser. Eventually I will get to them all, I am sure. What a challenge to decide on a winner. A very strong list, with some dark themes emerging. Thanks, Tracy. Interesting list: will you re-read them all before you decide…? Thanks, Sarah, so much for including all the info and I love the photo of you four together. Helps me picture the all-important meetings where you discuss the titles for the short list. One question: Did you have a long list by any chance? Just curious. Omigosh, a great and challenging list. I have not read a one, but Indridason’s is on top of my TBR stacks. I’ll never make it through all six, but I’ll do my best. Some of these are long, so I’ll have to prioritize, as I’m not reading quickly these days. It’s either aging or my glasses need an update! I’m not reading as quickly either, Kathy, due to volume of work. But I’m ploughing on! Is there a suggested priority list? I have Indridason’s book. I’ve read Siggurdardottir’s series, so I’ll try to buy this one, as I like Thora. I like Nesser, but this book isn’t in my library. And I haven’t read Wagner, Horst, or Persson. Abe Books have a few of these. I would prioritise these ones, Kathy. I think these represent the pick of the best! I’m loving this list, there is a few I’d like to try from here, the only one I’ve read is Light in a Dark House. This post is like my perfect TBR list. I am in love with LINDA, AS IN THE LINDA MURDER.